Thank goodness we don't go with the subject phrase, because even UAW doesn't flow off the tongue as well as PWE does. Some Ebay sellers don't seem to understand that charging $2.50 shipping on a vintage card means a PWE is a safe way to ship a purchase. I recently had it out with a seller that I'm sure was upset his '52 Lollar Bowman only garnered him only $3.50 so he dropped it in a PWE, though that was probably his initial plan anyway. And his excuse "Well, it got there safe - what are you upset about" was not a valid argument. No feedback for you! PWEs are for those shipments that you hope make it, but if they don't, it's not a huge loss. Many of you should be receiving some PWEs from me right now. In fact, anyone that is a member of Club PWE will be receiving a mailing from me. I went through the entire list the past few days and mailed to everyone. The last 10 went out today (cuz I ran out of stamps earlier in the week). I mailed to everyone for two main reasons. First and foremost, I have been lacking in my mailings to the group. Shame on me. Second, I have a column on my spread sheet for the last day I mailed. I wanted those dates to all be equal, and now there are. With the NHL kicking off today, I plan on dropping more hockey cards on those that signed up for some at the start of last year's Cup final. Plus, I have PLENTY of teams that no one claimed. So if you like hockey, like free cards and want cards spanning the years from the early 90's until today, comment below with the team(s) you would like and I'll drop some cards on you. If you think I don't have your address, you can find my email on either of the Wants links above - send it to me. Since we are talking PWEs, and hockey, and the Stanley Cup, I just received a mailing from Jeff over at Wish They Still Came With Bubblegum. Jeff is a big fan of the Hawks Cup opponents last season with the Lightning. He knows how to pack some cards in a PWE though when I pulled these gems from the envelope. 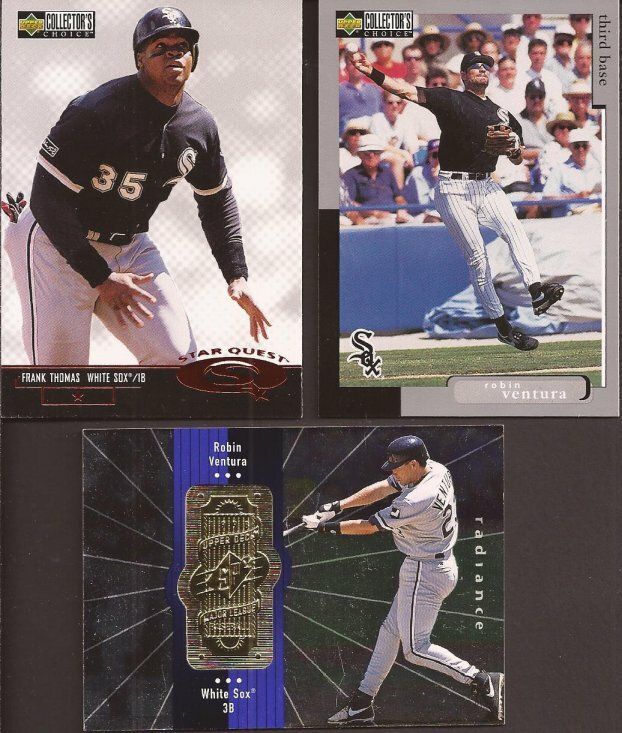 Couple nice Collector's Club cards with the Starquest Thomas and Robin throwing from the left field line. The Upper Deck SP at the bottom didn't scan as well as it looks in person. The gold center is recessed in the card like a medallion. And it's foil-sh. Find one for yourself. I may as well build the rainbow of these two cards. The purple Floyd makes the 4th difference 2010 Chrome card of Gavin. I also have the base, the X-fractor and the regular refractor. 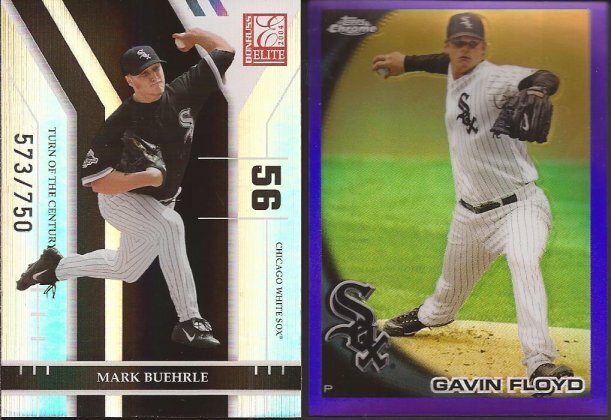 And the Elite Buehrle? Along with this Turn of the Century serialed card, I have the base and stamped Extra Edition. Thanks for the mailing, Jeff. So folks, watch your mailbox. And if you want to get in on the freebies, the link to Club PWE is above, and comment below for some hockey cards. Just had to bring the Stanley Cup up... that said I can't wait for tomorrow night. Hard to believe hockey is hear. Go Pens! I'm so glad hockey is back! With the Orioles and Texans done for the year I need a pro sport to distract me. Hey I think I'm in the PWE club. If you got extra Buffalo Sabres cards I'd take them...if only for the Miroslav Satan cards!